The maturation of the “Me Generation” who brought us the shift to liberal-leaning regimes across the West received little coherent exposition before this book. However with BOBOS in Paradise: The New Upper Class and How They Got There, David Brooks explicates the rise of Bobos — “bourgeois bohemians” — as a fusion of 1960s values and 1980s methods. In exploring this fusion, Brooks carefully and humorously reveals the underpinning of the ideological motivation of these people, which is 1968 itself — albeit tempered with a taste for what we hoped won the Cold War, which is the cornucopia of the fruits of personal liberty and free markets. the “bourgeois bohemians” are actually hybrids of yuppies and hippies. This group appeared in the 1990s and that is where Brooks centers his book. In his view, they came to power as a replacement for the old WASP hierarchy in America. While that ancient regime operated by knowing the right people, and having the right family, this new regime accelerates those who have the right education, the right careers and the right beliefs and lifestyle choices. Brooks shows us a new elite trying to justify itself with claims that it morally deserves what it has. As Brooks ably and humorously reveals, however, the downside of being in this new elite is inanity and pretense. Inanity, in that the trends they follow are even more boring than those of the WASP hierarchy before them. Pretense, in that the constant moral posturing by having to play nice with conspicuous consumption creates a useless, posturing and haughty lifestyle that is still just as product-oriented as the lives of the middle classes that its adherents disdain. BOBOS in Paradise: The New Upper Class and How They Got There is a personal favorite of mine because it demonstrates how the individualism of the leftism spectrum — Communism, progressivism, Socialism, anarchy and liberalism are different only as a matter of degree — quickly leads to the type of blind obedience we see in panicked crowds, faddish trends and lynch/witch-hunting mobs. This isn’t deliberate behavior, but defensive behavior designed to justify an inner selfishness arising from a total lack of purpose. Brooks hints at this through numerous satirical examples and tongue-in-cheek comments. Parts of this read a lot like Tom Wolfe and Bret Easton Ellis fiction that notice in excruciating detail the products that people use to compose their lives. For American Psycho‘s Wall Street bankers, the products are luxury goods and high-performance tools; in BOBOS in Paradise: The New Upper Class and How They Got There, as in A Man in Full and Bonfire of the Vanities, products are passive-aggression defenses of lifestyle. They aren’t there to be used, but to explain a life. In the case of the Bobos, it’s how they are morally superior and therefore deserve what they have. Conservatives should read this book because it reveals the nature of what opposes us. Liberalism is after all a social mentality that spreads by threatening people with ostracism. You join the club, and you’re accepted; you don’t need to do anything else. But even liberals hate a flat hierarchy, so soon the club fragments as we see in this book. The “bohemian bourgeois” movement is a postmodern keeping up with the Joneses, where you’re not so much conspicuously consuming as consuming specific things so that a narrative about your lifestyle is created. As a result, it’s more cryptic and twisted like a hipster conversation consisting of namedrops only. 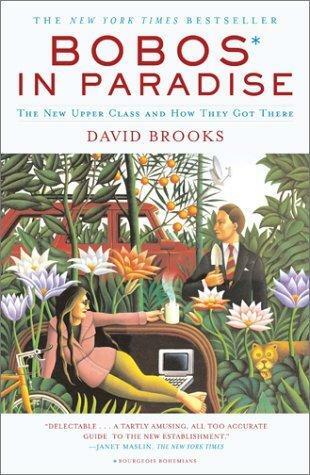 Underneath the laughs, BOBOS in Paradise: The New Upper Class and How They Got There shows us a society in deep trouble. It has lost its direction, and is trying to fill that void with ideology and lifestyle choices that exhibit that ideology, like Sovietism modulated into a consumerist ideology. Much like the millennials, the “Me Generation” who adopted this philosophy show a radical individualism that consists not of a desire to achieve things oneself, but to be part of the winning social group. This suggests in turn a society so fragmented that it has turned on itself, and people are looking for some reason to justify shutting out the rest and ignoring the certain path to collective doom. Witty, imaginative and insightful, Brooks’ writing bounces lightly through these otherwise crushingly heavy realizations. Instead, he chooses to help us laugh at the irony of the hippies and the Gordon Gekkos of the world merging into a single voice, attempting to fill the void of a lack of purpose with pretense and purchases, and finding the emptiness of that approach as everpresent as before.